As one of the simplest styles, and with some of the lowest online conservatory prices, lean-to designs are perfect for somewhere to start & can even be found in “kits” with pre-fabricated bases & sides which offer great value for money. The advantage of having a simple rectangular or square floor plan is that you can utilise all the space, as there are no awkward corners or angles to contend with when considering how or where to place your furniture. With so much glass used in the walls, it is well worthwhile thinking about how to regulate the temperature inside the conservatory as the outside weather can have quite an effect on the heat or cold that builds up on the inside of the room. • Thermally efficient (low-e) glazed units can regulate the flow of heat & cold through the glass. • Under-floor heating can provide efficient and even heating during colder months. • Roof Vents can greatly improve ventilation & reduce excess heat build-up during sunny days. • Poly-carbonate roofing panels can help to reduce heat build-up. • Tinted or coloured glass can also help regulate internal heat build-up. • Air Conditioning, although not essential, can really make the room very pleasant all year round. • Venetian, Roller or Roman Window Blinds; a cheap & effective way to control light. 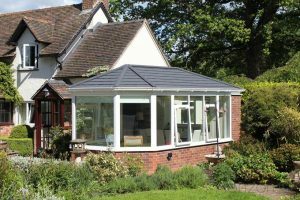 With such a lot of glass in the roofing it can mean that in sunny weather your conservatory may become too hot. One of the most common actions owners take to combat this is to fit Venetian or Roman blinds to the interior of the roof panels which can block direct sunlight and for some this could be a simple & cost effective answer, however fitting blinds does not fully stop the heat build-up and even though the direct sunlight issues is solved, your conservatory could still become very uncomfortable & stuffy due to heat build-up.